There is always a huge debate over which are the best golf courses in Hawaii and when you see the results you may be very surprised. We watch the PGA Tours Tournament of Champions played at the Plantation course at Kapalua each year then you look on line to see what are the best courses in Hawaii? Oh, a bunch of courses you have never heard of. The ratings are done by leading players and professionals, the reason you haven’t heard of many of these courses is simple, you can’t get to play them. For example, the number one rated golf course in Hawaii is Nanea, membership is by invitation of the owner, it’s as exclusive as Augusta National and they don’t want any publicity, some have rated it in the top 10 courses in America. There are 4 more top 10 Hawaii courses you may never have heard of Kukio, Hokulia, Kohaniki, Keolu. These courses are very private it is almost impossible to get a game unless you are a members guest or live on course. The most interesting fact is all these great courses are on the Island of HAWAII (the big island) about a 40-minute flight from Honolulu. The island of Hawaii has without doubt the best collection of golf course in Hawaii and there are a number ranked amongst the best that you can get to play. The iconic Mauna Kea, is the pick of them, built by Robert Trent Jones Snr in the 1960’s and redesigned by his son Reese Jones about 8 years ago, always ranked in the top 4 and regarded by many as the best course in Hawaii ,next door to Mauna Kea is the Hapuna Beach course designed by Arnold Palmer , the course has just completed a renovation including all new greens.Five minutes’ drive from Maua Kea Resort is the Mauna Lani’s fabulous North & South courses, the south course was home to the PGA skins game for many years, another 5 minutes’ drive are the two more excellent courses at Waikoloa Beach. Hawaii International Golf Week (August 18th to 24th) 7th annual tour and tournament to the big Island of Hawaii which is a 40-minute flight from Honolulu. Five- star accommodation for 6 nights in an ocean view room at the magnificent beachfront Westin Hapuna Beach Hotel at the iconic Mauna Kea Resort. Two world class golf courses at the resort and another five amazing courses less than 10 minutes’ drive. This event has become very popular and always attracts a great group of Aussie and Kiwi golfers who enjoy playing a great course, staying at a superb hotel and competing in an enjoyable competition. You will love playing four rounds on some of the best courses in Hawaii plus there’s two PGA golf pros on tour to help sharpen your skills (all included in the cost) You don’t have to be a great golfer to take part , just have an official handicap, the 4-round tournament is played in women’s and men’s divisions and even a scratch event for the guns. It’s a great week, welcome cocktail party, nightly drinks, excellent prizes and fun tournament dinner and entertainment to finish. For the non- golfers there are always plenty of activates, You don’t have to be a great golfer to join in just have a handicap this event has sold out the last two years. The Best of Hawaii Golf Tour (August 18th to 29th) Hawaii is a long way to go for just one week, after you have enjoyed the International Golf Week tournament and 6 nights on the big island as mentioned above, we take a short flight to the island of Maui and spend 4 nights at the beach front Marriott Wailea Resort. Wailea is Maui’s most exclusive resort area, five international resort hotels, 3 great golf courses, large shopping centre numerous restaurants, bars and other activates. After four nights in this golfing paradise you won’t want to go home so consider heading back to Honolulu and a few nights in the famous Waikiki, more time golfing and shopping paradise. spend a few nights at the fantastic Prince Waikiki Hotel which is the only hotel in Waikiki with all ocean view rooms, enjoy a round of golf at the Hawaiian Prince course. Waikiki is also a shopping mecca and the famous Ala Moana Shopping centre only a few minutes’ walk from the hotel. South Pacific Golf Classic New Caledonia (September 15th-22nd) three round pro-am at the Sheraton Deva Resort then 2 one day pro-am events in Noumea, full information available shortly . 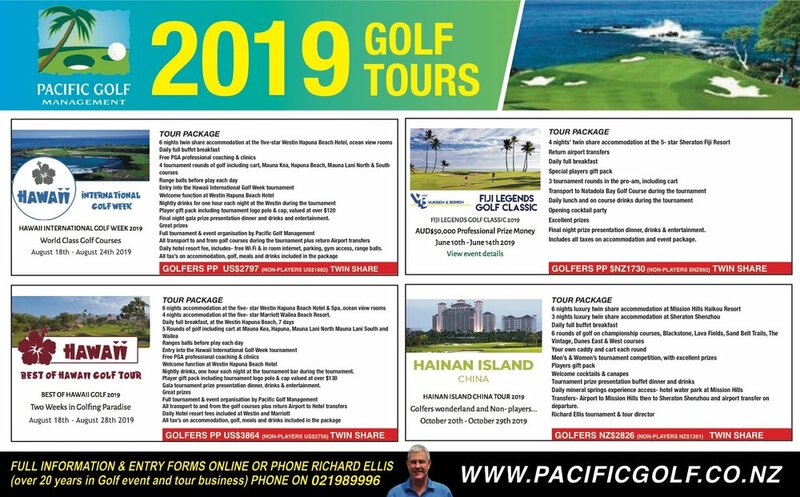 Richard Ellis from Pacific Golf Management, he has over 25 years’ experience running golf tours, international amateur and professional tournaments around the world and Richard personally overseas every tour & tournament. Go to www.pacificgolf.co.nz for full information or email richard@pacificgolf.co.nz phone Richard +64 21989996.